Housemaid are humans and as such deserves to be treated nicely. 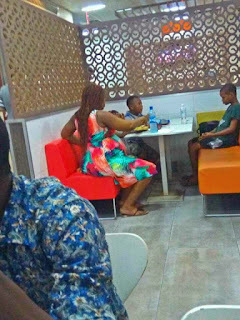 below is a true confession of an eye witness identified as Larry Shola who Recounts Saddening turn of event with a Lady who bought rice and chicken for her 2 children in a restaurant, but Buyys biscuit for her housemaid. "I went out with a friend to celebrate his birthday today and it was fun but something strange happened a woman came in with 3 kids for dinner and she orders for 2 plate of rice and chicken to my greatest surprise one of the kid was left out and was given biscuit to eat by the woman in the presence of the 2 kids. While they were eating the rice the little kid was holding his/herself to eat the biscuit and it was such a painful thing to see honestly African women are mostly Evil how much will it cost you to give to someone who probably takes care of this little ones when you are not at home its so painful and annoying no wonder witchcraft will not end in Africa I'm really saddened honesty...."
A little more show of kindness would certainly won't cost much. for those of you who treats your housemaids like trash always remember that Housemaid are humans and as such deserves to be treated nicely..